Obedience to the elders and the reproduction of their thought. What is key about these goals, however, is that they limit themselves to the user finding an entry in the catalog (albeit FRBR goes on to having the user obtain the item represented there). A study done by the University of Minnesota Libraries in 2006 (UMN 2006) took a much broader view of their users and user needs. They asked their faculty and graduate student users questions like “Where do you work when you are conducting research?” “How do you share source materials?” Just these two questions already reveal quite a lot: the librarians are not assuming that one conducts research in the library, and acknowledge that many people work in teams or groups that share resources among themselves. They also asked about library use: how often do these users visit the physical library, and how often do they visit the library web site, and what do they do there? The authors of the report (who modestly remain anonymous) then developed a model to describe what they had learned. 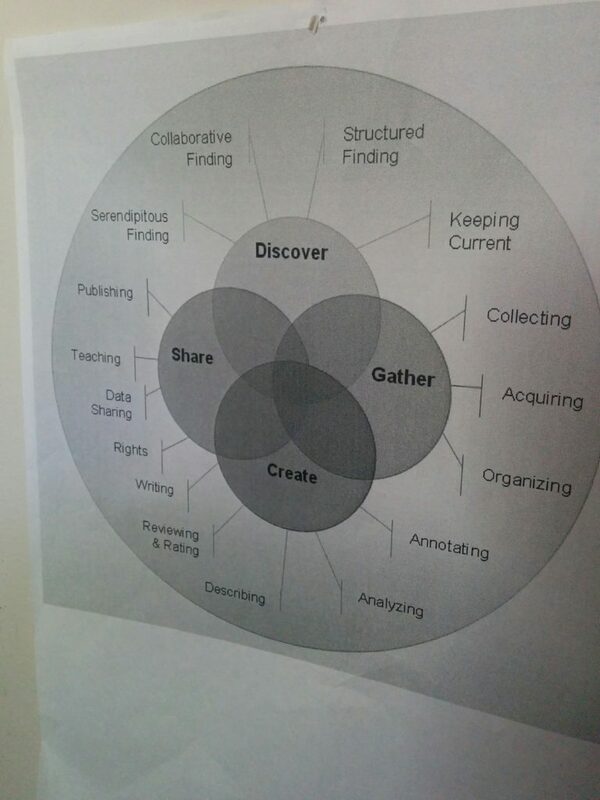 They borrowed the core of their model from a humanities researcher, John Unsworth, who described the primitives of humanities research as discover, gather, create, and share. Of these, only discover is usually seen as directly related to the library, and many, perhaps even most, discoveries take place outside of the library catalog. Yet if your view is that libraries support the research function, then all of these primitives could possibly have some interaction with the library. The share primitive includes teaching, and the library may be directly connected to the course management system such that course materials are shared through library functions. The gather function includes acquiring and organizing, which might mean library support of bibliographic tools. And the create function could be supported through shared annotation tools, which could be especially important in those disciplines where research is done through collaborative work. Karen Coyle, The Model, FRBR Before and After.